The extraordinary achievements made by our neuroscientists and brain researchers have made it clear beyond a shadow of a doubt that the conditions once classified as “mental” are indeed physiological. The military should classify war-related brain disorders as what they are — combat wounds — and accordingly should reconsider its policy against awarding the Purple Heart to veterans with chronic war-related mental health conditions. Removing the false distinction for mental illness and making these policy changes would play a major role in overcoming stigma and encourage more soldiers to seek help when they need it, improving the overall health of our fighting forces. We know that providing treatment services early on in the course of these illnesses not only costs less but also improves the life trajectory for those receiving treatment. No one should have to wait for a crisis to receive services. The neurological illnesses affecting veterans impact an estimated 100 million Americans and are costing our nation more than $1 trillion annually. Neuroscience research can provide valuable tools to repair and prevent these combat injuries, while putting an end to the notion that an illness of the brain is just an illusion to be willed away. We are at a stage in biomedical research where there can be real hope, confidence even, that with proper funding, scientists can devise treatments and cures that will spare veterans and their loved ones the agony that now accompanies living with PTSD. New research into depression, substance abuse and brain disorders are creating opportunities for healthier lives for all who face these challenges. 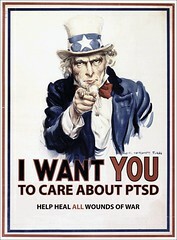 We can honor our veterans and ourselves by fighting stigma together. It’s a battle we know we can win. Had HBO's Veterans Day documentary concentrated on the fallout from the Iraq and Afghanistan conflicts on soldiers and Marines, it would have been a powerful statement about the emotional suffering of modern-day war. But as Wartorn 1861-2010 (tonight, 9 ET/PT) demonstrates, the military and their families have dealt with largely ignored, little-understood post-traumatic stress disorder far longer. Co-produced and hosted by former Sopranos star James Gandolfini, Wartorn is a somber, gut-wrenching reminder — and warning — about combat-related stress that can lead to depression, violence and suicide. Civil War-era doctors called it hysteria. In World War I, it was known as shell shock. By World War II, it was termed combat fatigue and, as in the aftermath of past conflicts, considered cowardly and left largely untreated. The program opens with the case of Angelo Crapsey, a Civil War infantryman from Pennsylvania who chronicled his descent into madness — known then as hysteria or melancholia — in a series of letters. Crapsey was a gung-ho soldier in 1861 when he enlisted in the Union Army at 18. He disparaged a sergeant who committed suicide and called deserters “cowards.” By the fall of 1863, he wrote that “I am clear off the hooks” and was discharged. Crapsey’s sister noted that he “looked wild” after his return home and had to be tied to his bed. He committed suicide in 1864. After the Civil War, according to the show, more than half the patients in mental wards were veterans. Gandolfini enjoyed good access for this project, including a sit-down in Baghdad with Gen. Raymond Odierno, who recently left his post as the commander of U.S. forces in Iraq. Odierno says the military is much more aware of stress-related problems than it was during earlier wars. “I think society changes over the years,” says Odierno, adding that almost 30 percent of soldiers suffer from post-traumatic stress after combat. Do you have anything special planned for Veterans Day? Did you even realize that tomorrow is Veterans Day? Sadly, in much the same way that the wars we are fighting in Afghanistan and Iraq have been pushed to the periphery of our national conversation, the day set aside to honor America's veterans usually gets short shrift. Despite all the lip service paid by politicians and pundits to supporting our troops, the needs and struggles of those returning home are rarely in the spotlight. According to the Department of Veterans Affairs, 107,000 veterans were homeless each night last year. That's an improvement on the 131,000 who were homeless in 2008, and the 154,000 in 2007, but it's still a very troubling figure. And there is more bad news: veterans are twice as likely to commit suicide as the general population. According to VA Secretary Eric Shinseki, "on average, 18 veterans commit suicide each day. Five of those 18 are under VA care at the time they take their lives." And between 2005 and 2009, a soldier on active duty committed suicide every 36 hours. What's more, roughly 300,000 vets have come home from Afghanistan and Iraq suffering from post-traumatic stress disorder. As devastating as these numbers are, the flesh and blood stories behind the statistics are even more compelling -- as are the inspiring stories of the work being done by people dedicated to helping veterans. To honor the sacrifice and service of the men and women of America's armed services, HuffPost Impact, in partnership with Causecast, is launching Salute to Service -- a week-long series highlighting the stories of veterans who have committed their time, energy, and effort to helping serve their fellow soldiers. In the decades after World War II, you could scarcely go a few blocks in Chicago without seeing a sign of why we commemorate Veterans Day. There were, on many street corners, memorials hammered together in a nearby basement or garage, listing neighborhood men and women who died serving their country. Most are gone now, along with those who would lay a few flowers near them on Nov. 11. There still are war memorials around Chicago, more substantial monuments sponsored by civic groups or veterans organizations. Most of the time, they're scarcely noticed. On a recent afternoon, Cyress Rose walked past the Korean War Memorial in a park on Chicago's Far South Side, part of his daily route to and from De La Salle Institute. He had no idea of what was marked by the small semicircular monument — erected in 1988 to remember those who served in what's been called the "forgotten war." "They don't teach us about that," said Rose, 16. Yet someone remembers. Lying in front of the monument, half-hidden under autumn leaves, was a wreath that clearly hadn't been there long. Some of its artificial flowers were bright red. An attached card read: "IN MEMORY OF JIM CLARK KOREAN WAR VETERAN." And, finally, if you are a veteran or military family member, here's a handy list of Veterans Day freebies and discounts. What Can Civilians Do? Show Them They Are Not Alone Beyond Veterans Day.